Today was the fifth grade's State Day. This is a big day for these guys as it is the culmination of a long research project about a state of their choice. Aiden chose Missouri because, "Uncle Kevin is from there." Of course, I had to remind him that my brother is actually the only one of us that's from Georgia. He merely lived in Kansas City for awhile. That was fine with Aiden. He just likes to choose things to be different. It was his project, so I let him choose. I have come a long way from my days of perfectionism. I have realized, after having a few years of parenting under my belt, that it's better to let the kids do the projects and papers themselves. What I've discovered is that my kids don't always win the prizes at the Science Fairs or get the perfect grade I'd like to see...and that's okay. What's important is that they learn the process and gain some self-confidence along the way. That's not to say, I don't oversee or make suggestions along the way, only that the work...all of it, is theirs. I'm now finding pride, not so much in perfection as in a job well done on their own. Because I allowed Aiden to choose a state on his own and didn't push for the obvious, we both learned some new and interesting things. Who knew that the ice cream cone was invented there, along with iced tea? I have to admit that the costume idea took a bit of prodding. He wanted to be some kind of athlete but to me that was a bit of a cop-out. Instead I encouraged him to do some research about famous people from Missouri. I tried for Mark Twain. How cute would he have been as Huck Finn? However, Jesse James' notoriety won him over. I have to say that my favorite part of the entire project was standing on the back porch with him setting the edges of that sign on fire for a weathered effect. He thought that was very, very cool. It was a special moment of bonding for us and I thought that was even more cool than the flames. Where does the time go? Wasn't it just yesterday that you were my baby? You've grown up so much over this past year - from the baby to a big brother. 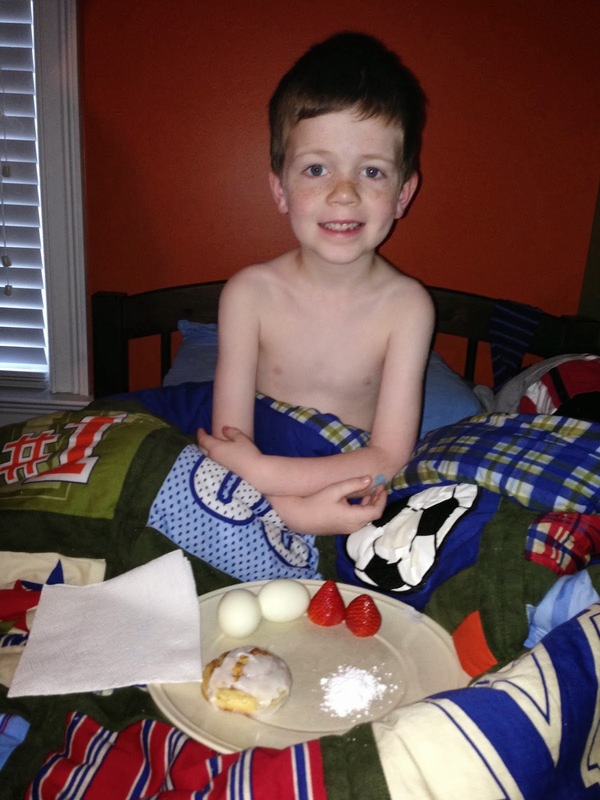 Your choice of celebration this year was a breakfast of strawberries, cinnamon rolls, hard boiled eggs, and a fruit smoothie. We then had the family and your godparents join us at your team's basketball game, which you won. Hooray! We celebrated after at the Golden Corral - they had you at chocolate fountain. I love the Kindergarten year. To me it is absolutely miraculous that you go from recognizing letters, to reading. Listening to you read to me is so exciting for both of us. It won't be long before Felicity is listening too. The boys in your class are such good buddies. This is a very good thing, as you'll be spending the next twelve years together in school. What a gift! 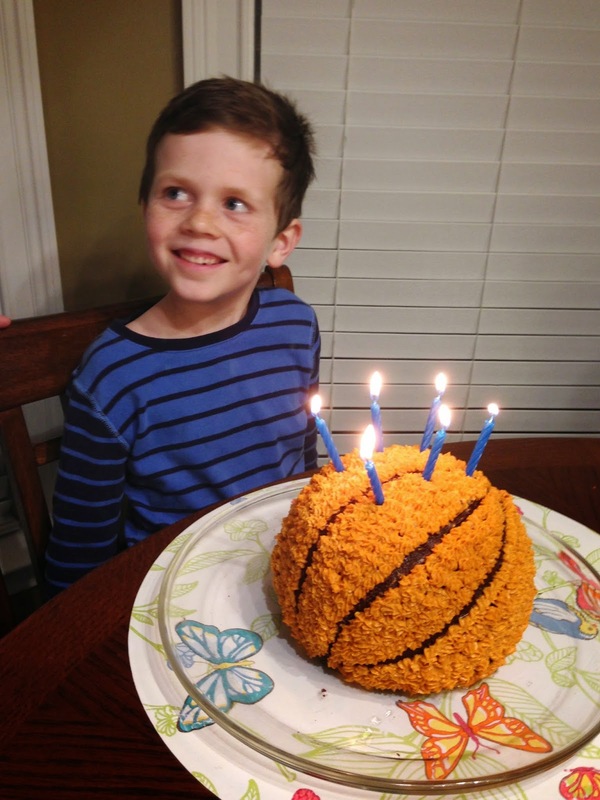 How appropriate that you requested a basketball cake. Watching you run up and down that court with such determination makes me so very grateful. There was a day, not so long ago, when I wondered if I would ever see you walk or climb the stairs and now you're out with your classmates dribbling down the court (equally well with both hands!). Awesome! You have always been such a tenderhearted boy. Watching you with Felicity has been so very sweet. She loves you and I pray you always love her as much as you do now. You know that moment when your perfect newborn goes from that perfection to waking up several times a night and crying a lot during the day and never letting you put her down? Well, I'm there. I've said this before (Out of curiosity, do you get money for coining a phrase? ): kids are many things, but convenient is not one of them. I don't know if it's been too long, or I'm too old, or God has totally cleared these kinds of memories from my mind, but y'all, I've forgotten how hard it is to have a baby. These last few months have been one chaotic upheaval after another. Beginning moments after Felicity's birth we had a stay in the NICU; daily blood tests at the hospital for jaundice; a water heater freezing and breaking - flooding our master bedroom, closet, and bathroom; our bed was broken; our ceiling caved in and insulation was blown all over everything causing Felicity and I to bunk with Mackenzie and my underwear to be relocated to the family room (YES, my underwear IN THE FAMILY ROOM); my mother-in-law had a stroke; my husband has experienced some scary health issues; the power went out; the baby developed reflux; the Glory Run and 4th grade play have started; I’ve developed mastitis. It's been a little overwhelming. Having a baby is kind of a big deal...even the fifth time, maybe, especially the fifth time. That would be enough, having a newborn is enough. However, having a newborn when one thing after another happens, is more, ever so more than enough. When you have a baby, let's face it, everything feels like a much bigger deal because the hormones are flowing, the sleep is not, and the brain has left the building. Trips to the ER, visits to the hospital, a room coated in insulation, relocating to the second floor are all much more complicated. Of course, a trip to the grocery store is also more complicated when you have a baby. I get through this by telling myself that this is only a season, albeit a very long and hard season. I also cry some, call my mom a lot and humbly allow my friends to bring me meals and hold my baby. Here's what I've gained from this: I can not do this by myself. I can NOT do this by myself. I stand here to tell you that lessons in humility are hard. There are a lot of other lessons I'd prefer to learn. God and I apparently disagree on this point. I'm thinking what He'd like to tell me is that my job is not to decide on the lesson, but rather to learn it so we can move on. Since I’ve got this, I’m hoping I’m getting the lesson too. Hey God? Can we move on now? The boys have been inquiring about growth spurts lately. How tall are you? When did you grow? How tall do you think I'll be? These are daily questions they ask everyone even remotely related to them. Apparently, they are in a hurry to grow. This could have to do with the fact that they are currently playing basketball. 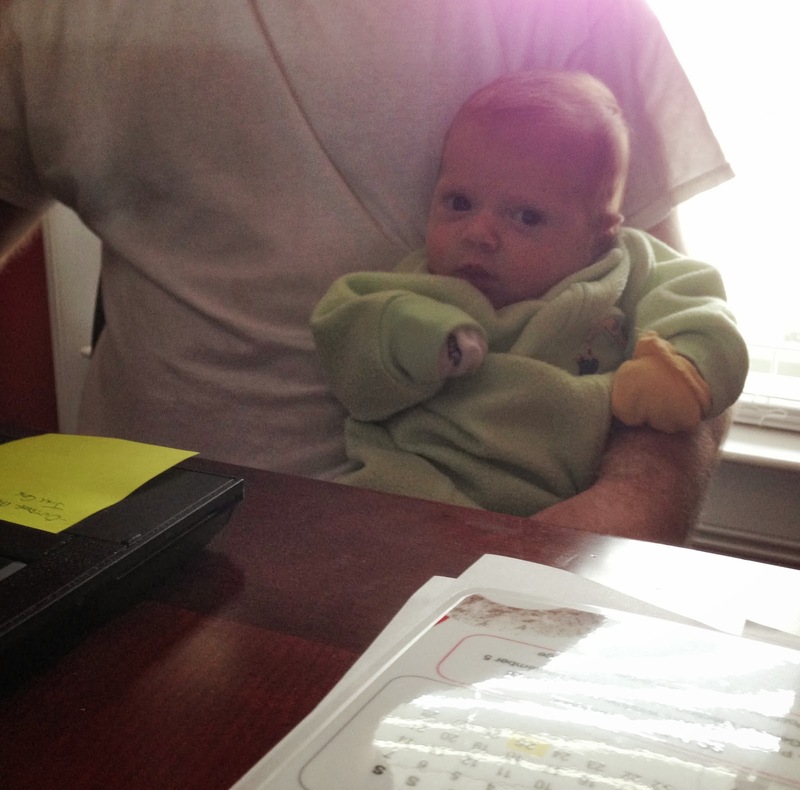 This morning Aiden came in while I was dressing Felicity. "I think I'm growing Mama." "Oh yeah? What makes you say that?" "Well, my neck kind of hurts and so do my intestines," he said as he pointed to his ankle. "Bud, those are not your intestines. If your intestines are down there, we have a lot more to worry about than whether or not you're growing." "Whatever, you know this thing. What is it?" Again, he pointed to his ankle. "Are you talking about your Achilles tendon?" "Yep that's it! Does that mean I'm growing?" "One thing it means for sure," I said. "You need a lesson in anatomy." When I was a kid, I loved Valentine's Day. Decorating the card boxes, cutting out hearts, gluing, glittering, addressing my own cards...it was all wonderfully magical at the elementary level. In middle school and high school it was relatively fun. I still exchanged Valentine's with my friends and there was always the hope that I might get one from an actual boy. As I got into college and decided not to date anyone for a while, Valentine's Day lost a little of its luster. My mom, of course, managed to make it special for me and I often chose to do something fun with my other single friends. The older I got, the less enamored I was with the day. And then came Nelson. He was an over-the-top romantic as well as an over-the-top gift giver. Combining those two qualities with the day itself was a total win for me. I was in love and truthfully, that was all I needed. 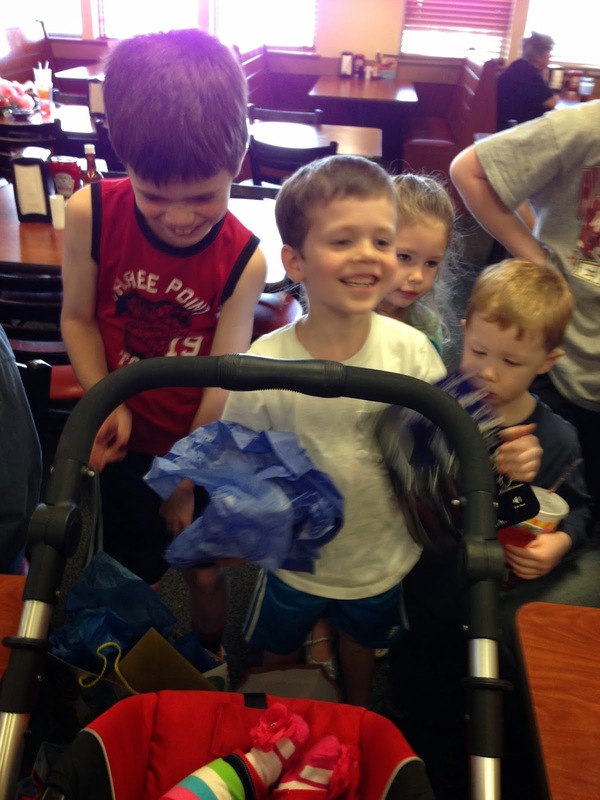 The gifts and celebrations were just icing on the cake. Sometime along the way in our marriage, we changed the way we celebrated. It was one of those seasons when flowers, jewelry, and candy seemed entirely too trite for the love we shared. We decided that instead of giving each other gifts, we would do something together to commemorate the day. Some years we splurged on a night at a local bed and breakfast, other years the splurge was dressing up for a nice evening out. This year Valentine's Day fell the day after our Icepocalypse, as we southerners refereed to it, as well as three months post birth of our fifth child, and the flooding and catastrophic disorganization that ensued in our home. In other words, I had nothing. There were no heart-shaped pancakes for breakfast, nothing red at lunch. My idea for dinner was for Nelson to pick up some sushi. Of course, this was magnified by the power of Instagram and Facebook to make me feel like a loser as I viewed photos of everyone else's banners, flowers, etc. I don't usually let that stuff get to me, but between the hormones and lack of sleep I'm getting lately, it was enough to prevent me from feeling the love. I was in that moment when I got a text from a dear friend who said she had a strong sense that God wanted her to tell me He loved me. Totally out of the blue - right in the middle of me seeing the tenth picture of kids holding up their magnificent homemade Valentines (my kids totally did the boxed card with Starbursts this year). I was so glad she had the courage to send that to me. She was right on the money and just like that, I was feeling the love again. I got up, made some sweet homemade cookies for my kids and started feeling just fine about take home sushi. Then the doorbell rang and it was the furniture company returning my bed - the one the flood repair guys broke and I hadn't slept on in over a month. I took a picture, sent it to Nelson with the message, "Happy Valentine's Day!" Done. Until...I got a text from my brother, whose power was still out. He was worried that their house was too cold for their baby and could they stay another night. Y'all, their house was 47 degrees. I didn't hesitate. I sent a text to Nelson that there was a change of plans since neither of them eat sushi. Luckily, I had a large package of beautiful pork chops, which happen to be one of Nelson's favorites. My parent's power was still out so we asked them to join us too. That night, as the 12 of us sat around the table enjoying a candle light dinner, the thought occurred to me that this is what Valentine's Day is all about. If we are going to celebrate love, why not do it in the truest sense of the word? Don't get me wrong, I'm not throwing in the towel on romantic dinners for two, flowers, or chocolates. Those things are wonderful, but they're not love. Love is knowing someone well enough to complete each other's sentences. Love is holding the crying baby and washing the dishes. Love is sacrificing the one free hour you have to make red and white swirled cookies for your kids. When this is the love you have, it truly is all you really need. Funny that the day after I wrote about last week's snow, we were yet again battening down the hatches for more winter weather. You know it's expected to be bad when you get a call from the school on Tuesday that it will be closed for the rest of the week with nary a flake in sight. The kids came home with great anticipation, totally bewildered by the fact that yes, they will still be having piano lessons. These lessons require a walk across the backyard, across the street and through the next backyard. It wasn't even raining yet. I was certain they could handle it. I did notice, when I walked Dawson over, that it was getting much colder and the wind was picking up. By the time I went to bed Tuesday night, I could hear the pitter patter of the ice. It was the beginning of several inches of slush and ice that continued through the night. Wednesday the kids tried to go out but quickly discovered that slushy ice combined with cold and wind is not so fun to play in. The city had been warned that power was going to be going out. We had power companies from several states setting up camp not far from us, so it was no surprise when the lights started to flicker. We did what any family with five kids who were stuck in a house knowing their power could be cut off at any minute would do. We watched a movie. We felt pretty lucky to make it through without losing it. We had some friends over for chili and sent the kids to bed. I decided to walk my friend home so I could say I had been out in it. There was something eerily peaceful about the walk. The city was completely quiet so we could hear the crunching of the ice beneath our feet. It felt much like a scene from a scary movie. You know, the part where the characters are thinking everything is hunky dory and then the ominous music kicks in. The ice started falling again and the sky lit up. Between the cracking of the tree branches giving way to the weight of the ice and the lightning that filled the sky, I felt it was time to bid my friend goodbye and high tail it back home. Come to find out, it wasn't lightning, but breakers blowing that lit the night's sky. I was awakened Thursday morning around 3 by Felicity who felt like a popsicle. I looked over at the clock and realized the power had finally gone out. I walked downstairs, turned on our gas fireplaces and went back up to put the baby in bed with me to keep her warm. I have always loved our gas fireplaces and stove top. Today, I was truly grateful for them. We stayed near the fire and ate what we could without having to open the freezers. Realizing how cold it was and that not everyone was as warm as we were, I shot a message to another family to come join us. An hour later, the house was brimming with people of all ages. The body heat alone helped us stay pretty warm. We played games, talked and genuinely enjoyed our time together. Before we knew it, the sun began to set. I gathered every candle I had in the house and filled the kitchen with them. She had food she needed to cook and no way to cook it so she brought it over and we carried the day into the evening with the most romantic paper plate spaghetti meal I've ever had. We were lingering at the table discussing sleeping plans for everyone when the lights came back on, less than 24 hours later. I was happy to know I wasn't going to lose all the food I had in my freezer, but just a little sad it was over. For most people in the city, the situation was much more dreary. They estimate it may take over a week to get power back to some. For us, however, it was a day long stay-cation with friends. There was no noise. There were no distractions or hurriedness. There was challenge and adventure to make due with the food that was available. There were long conversations. There were life long memories made. We are thankful we were spared any more home damage. We are thankful that the home we built was used in yet another way we intended for it. We are blessed by the generosity of friends who shared a meal with us. A few weeks ago we had some snow. Well, some is a bit of an understatement for this neck of the woods. We don't do snow down here y'all. Truth be told that's the fun of it. When we get a little snow, everything shuts down. We don't have salt trucks or snow plows so the roads are scary and the people who try driving on them are even scarier. We hunker down, drink lots of hot chocolate, go outside with multiple layers and plastic bags over our feet because we don't own snow gear. I may be in the minority when I say that I love it...all of it. We have so much sun, heat, and humidity the rest of the year, that I like to be able to wear a sweater for a few months. And when it comes to snowman building and sledding, I turn into a kid again. When it snowed this time though, I had an infant. I couldn't take her out so I was stuck inside watching all the fun from afar. I went back and forth from being fine about that and hating that I was missing all the fun. Thankfully, I have great friends who took the big kids sledding with them. I sent them on their way happy they were going but sad I wasn't with them. Nelson was home that day but the baby wasn't napping much with all the ins an outs of the kids. When I finally got her down, it had been so long that I figured the kids would be on their way back. While I was debating what to do, my cousin, who is a northerner, walked through the door. She was more than willing to drive me to the kids. I was happier than a kid in a candy store. How great is that? God loves me. He worked it out so that the baby slept, my cousin showed up, I saw the kids sled...and I took a few trips down the hills as well. In the grand scheme of things, there were much more important problems for Him to solve, and yet, He saw fit to let me have this little gift. Tonight Nelson and I were given the precious gift of time. Felicity's godparents offered to stay with the kids for the evening so that he and I could go out. It's amazing what I take for granted. Leaving the house without lugging that ever heavier car seat, sitting down at a restaurant in no hurry to order or do anything but just be, eating food while it's hot, and being able to cut my own food because I'm not breastfeeding the baby are all things I indulged in this evening. The icing on the cake was that this was time with the love of my life sitting across the table enjoying all those moments with me. Children are wonderful blessings. Husbands are too though and it's important not to let one blessing take the other away. I was staring at Felicity today thinking that she looked familiar. Of course, I think all of my kids have looked pretty similar in their newborn stage, but this was something different. I decided to pull out my baby book and guess who she looks like! Today Felicity was Max's show and tell in Kindergarten. His teacher had him meet me in the hallway so he could help bring her in. She then instructed all of the students to put everything away and turn their attention to Max. When we walked in, every pair of little eyes was on our sweet Felicity. "Max," instructed his teacher, "tell us about your show and tell." Suddenly, my boisterous five year old was shy. "This is my sister, Felicity." "Don't you want to tell them anything about her?" I prodded. "Who would like to ask Max about his show and tell?" his teacher offered. Hands popped up around the room. "She's really cute," said the first child. "That's not a question," explained the teacher. "Can she crawl?" wondered one of the boys. "Can she jump off the couch?" another boy wanted to know. Now laughing out loud, Max again said, "No!" "Why don't you tell your friends what she can do?" I suggested, thinking about how she has recently started to smile and coo. "She poops!" he declared with enthusiasm. Not exactly the information I had in mind, but true, very, very true. Having Felicity join our family has been so, so fun and sweet. But what has been just as sweet has been the her effect on her brothers. Of course, Mackenzie absolutely adores her little sister, but I expected that - brother or sister. The boys, however, have surprised me. The older kids have always loved all the babies. They're older now though, so I thought they might get over her quickly. That could not be farther from the truth. I've been sharing a room with Mackenzie and Felicity for the last month due to some flooding issues we had (this is a story in itself - maybe another day). Mackenzie has extended her already lengthy morning routine due to her constant gazing at Felicity. "May I please go get her Mama?" I totally expected that. She's a second Mama, just like I was. Once I take Felicity downstairs to change and dress her, it's Aiden who is the first one to come to see her. "She's so cute Mama! How can she be so cute! Can I hold her? It's been really, really long since I've gotten to hold her." And with those words, and how softly he says them, I'm no longer admiring my cute newborn. Instead, I'm standing back in amazement of how my rough and tough boy, the one who can barely stand a hug anymore, is so taken by this small being. The sweetness she has brought out in him brings tears to my eyes. Of course Dawson and Max are not to be left out. They are the first ones to kiss her in the morning and it's the last thing they do before going to bed. They do not miss one day. Every day is a fight to see who gets to sit next to her in the car. The bickering, it's driving me crazy. The reason, it's making me melt. Last Friday I brought Felicity to school with me while I was having a rehearsal for the fourth grade play. "Is she coming with you?" they all wanted to know. "Mama, you can just leave her in my classroom while you practice," suggested Aiden. "We'd love to watch her." "Why not?" he seriously wanted to know. "Well, I don't think you'd get much work done. What if she cries?" "I could bring her to you." I could tell he had the whole plan hatched out in his head. "How about you ask your teacher if I can drop by with her after rehearsal so you can show her to everyone? Does that sound okay?" "Can she come to my class too?" Dawson wanted to know. So there I was, walking the halls of the elementary school with the best show and tell item all year. Their classmates oohed and ahhed over her while each of my boys beamed with so much pride they almost burst. I told Dawson's class how we chose her name and what it means. I told Aiden's class how she and Aiden are buddies because they both have red hair, they are the only two kids not born in a leap year, and they were both born on the 18th. The blushing that ensued was priceless. Here's what I'd like you to take from this. Have more kids. Sure it's hard, and, let's face it, babies are anything but convenient. Kids need siblings. They teach each other about sacrifice and selflessness. They teach loyalty and love. Mostly though, they bring out the best (and yes, often times the worst) in each other. This baby, our sweet little Felicity, has brought out qualities in her siblings that I had yet to see, and believe me when I say, it is worth every single minute of it. And tomorrow? Well, it’s show and tell in the Kindergarten class and guess who Max is bringing.